PIG Poly Drip Deck helps to eliminate the formation of dangerous puddles and slick spots to keep workers safely on their feet. 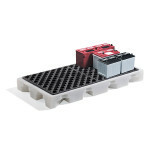 Low 15cm profile provides easy loading, unloading and access to drum tops. Tested for chemical compatibility, PIG Drip Decks won't rust or corrode. If your customer requires floor space flexibility, try the Modular version.